The Lakeside Course is located about 1/2 hour from the resort property, with shuttles available if arranged 24 hours in advance. This scenic layout features a mix of tightly tree lined and open holes along a rolling terrain, with generally ample room off the tee. Sixty four soft sand bunkers are situated near the landing zones or greenside, and water (in the form of ponds or creeks) comes into play on 8 holes. Deep, dry ravines often come into the picture as well, particularly on the front nine. Holes 5 through 8 all demand carries over these deep crevices either off the tee or on the approach, as does the long and difficult par four 13th. Land in these ravines and your ball is gone! Some of the prettiest holes however, feature carries over ponds. The par three 3rd is one of them, and the 197 yard par three 11th is the signature hole with a water hazard in front and a beautifully landscaped cascading stream along the left. A man-made waterfall rests behind. There are 4 sets of tees at the Palmer Lakeside, that play to distances and slopes measuring 6645 yards/135 slope, 6080 yards/127 slope, 6270 yards/127 slope, 5634 yards/121 slope for men and 140 for women, and 5107 yards with a slope of 124 for ladies hitting from the forward tees. On course yardage blocks are posted at 100, 150 and 200 yards (and 250 on par fives) and sprinkler heads are measured to the center of the green on all par fours and fives. All par threes also have posted yardages at each tee area. Color coded flags on the greens indicate front, middle or back hole locations. The green complexes vary in size and shape, but most have gentle undulations, with slopes that are sometimes difficult to read. There is plentiful greenside mounding, but lots of room - providing ample recovery opportunities. This is a pleasant course to play, with enough challenges for the avid golfer, yet player friendly for mid to high handicappers. Ladies hitting from the front tees will find the ravines and water hazards pretty much removed from play, except for a couple forced carries. 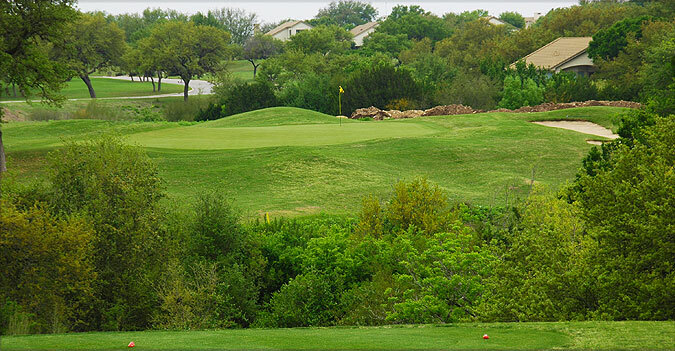 As is true with the other three Barton Creek courses, forecaddies are mandatory on Lakeside for guests of the resort. They are extremely knowledgeable (especially helpful in reading putts) and good company. On property is a clubhouse with restaurant/lounge, pro shop and beautifully appointed locker rooms with showers. Practice facilities include a targeted grass range (complimentary balls), short game area with sand bunker, plus large putting green. For more info, visit our page for the course, with direct link to their website by clicking here.